• The B-Mets all wear their pants high. • Speaking of inconsistencies, the Sea Dogs don’t all wear the same numeral font. • And speaking of uni numbers, Keoni DeRenne’s number is riding mighty low, no? • And here’s the real prize of the evening: Ladies and gentlemen, behold Brandon Nall, a pitcher who wears No. 2! I just about jumped out of my chair when I saw that. The Red and the Black: Earlier this year I reported that a source with the Reds had told me that the team would be eliminating black from its uniform next season, and possibly adding some navy blue. More recently, some of the Reds’ broadcasters have reported that there will be no navy next season after all. In e-mails to me, many readers have interpreted this to mean that the team’s unis won’t be changing at all, and that black will still be part of the team’s color scheme. Of course, this still doesn’t address the navy issue, but it seems pretty clear that the black is on the way out (and not a moment too soon). Cookout Update: The weather report for this Sunday’s Uni Watch cookout is looking iffy, so we might have to move it to Labor Day (or, in a worst-case scenario, bump it back a week). I’ll make a decision one way or the other on Saturday and send a note to everyone who RSVP’d. If you RSVP’d but don’t have weekend e-mail access, send me your phone number and I’ll call you. With the holiday weekend looming, I might post something on Sunday or Monday — or I might not. Either way, back on Tuesday for sure. Isn’t this black on the chest, or does my computer not reveal it as navy blue? If you are going to go with the high socks look, is it easier to do it with a shorter inseam than you regularly would go with? I like the long pants look, and the high socks look, so I was thinking I might need 2 pairs of pants. I’m feeling particularly stupid this morning, so can someone explain the deal behind the number “2”? I know pitchers usually wear higher numbers, but is it that rare? I’m pretty sure that’s supposed to be navy. As you can see here in 1936, this is the first year (post 1900, unless you count the whole jersey being blue like this in 1909) any color other than red or white made it into the chest logo, and it’s definitely blue. It looks like from that webpage from 1939-1955, the same blue is inside the logo before they went to this in 1956. Then the blue returns in its old form from ’61-’66. Only to see it replaced by black in 1999. I really just seems to be a matter of keeping track of the entire uniform (hats give it away until 1955. So, though it’s not entirely clear on the website, the ’61-’66 unis are almost definitely blue inside the crest. Generally, uni goofs are more common among the minor leagues, which often seem to get the hand-me-down unis & equipment of the big club. 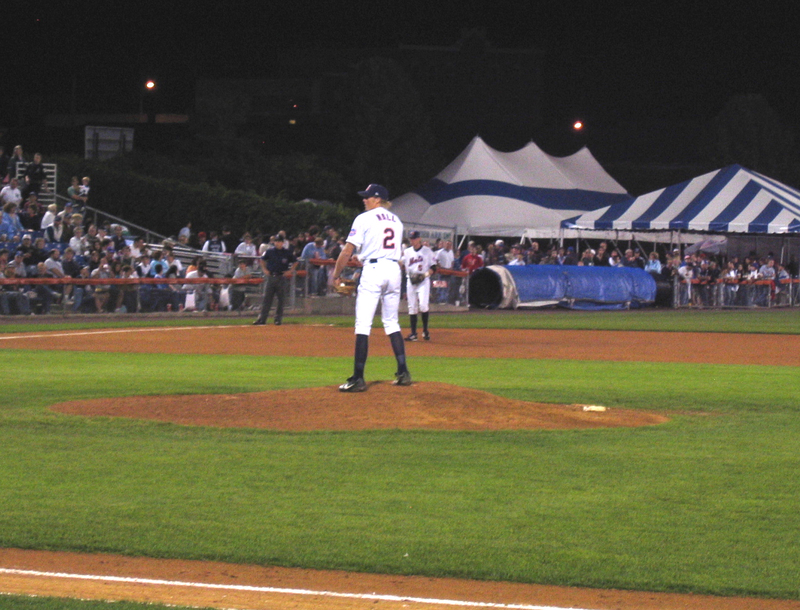 Willie Collazo pitched a game for the Tides earlier this year wearing No. 7. “The Red and the Black”…i dig the blue ÃƒÂ¶yster cult reference. 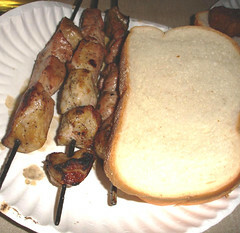 Spiedies look good, but being an Astoria resident, I am partial to the souvlaki (which is pretty much the same thing as a spiedie…only better!). Check out the multiple logo creep on this Toledo player. He’s got an Oakley logo on the shield, Nike wristband, and UnderArmour wristband and gloves! These throwbacks froms 61-65 have a very dark blue. The description say the numbers are red on black, but the piping on the arm holes is navy blue. So, I’m going with navy blue for the patch too. Then again, this is a replica and people make mistakes. 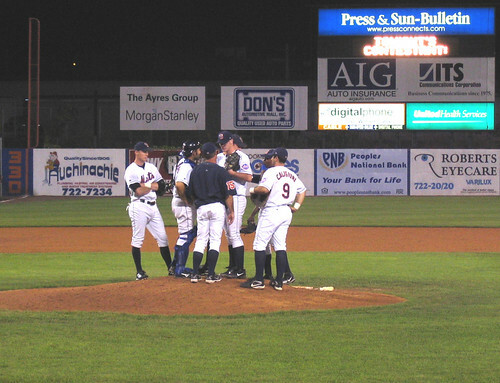 In the photo showing the two different number fonts for the Sea Dogs, the player on the right has a font that appears to be identical (or very similar) to the Red Sox’s number font. This makes sense since the Sea Dogs are a Red Sox affiliate. The uniform might be an old Red Sox uni. As far as the minor-league high socks are concerned, the St. Louis Cardinals require their minor-league players to wear the high socks, with the stripes on the socks showing. Anthony Reyes (called up today) still wears the high socks, and Jason Marquis has gone to the same look in an attempt to change his luck. 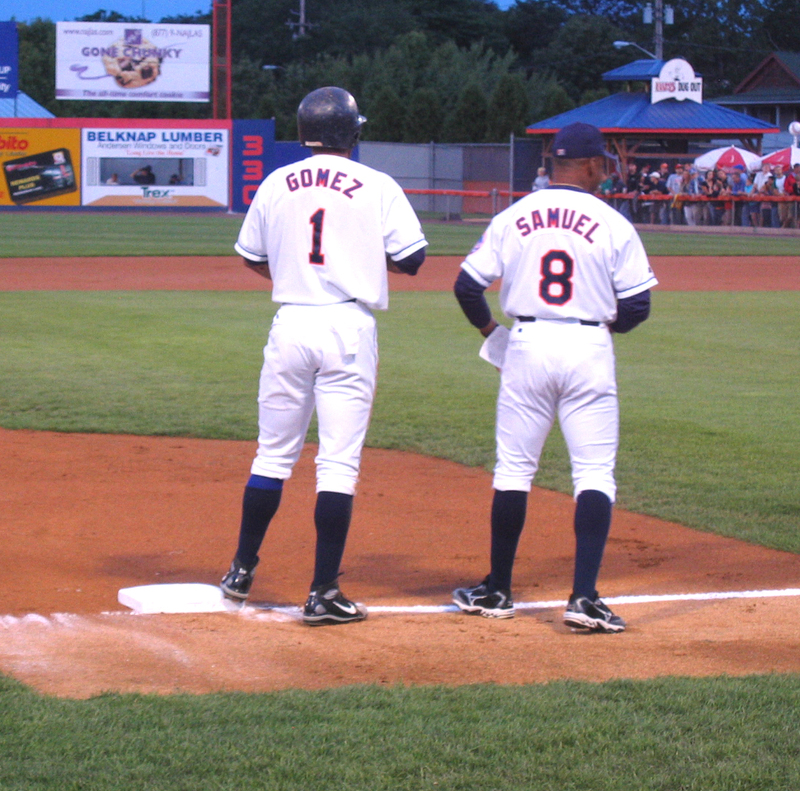 [quote comment=”7292″]In the photo showing the two different number fonts for the Sea Dogs, the player on the right has a font that appears to be identical (or very similar) to the Red Sox’s number font. This makes sense since the Sea Dogs are a Red Sox affiliate. The uniform might be an old Red Sox uni. [/quote]The picture of Keoni DeRenne also shows the BoSox number font – I would presume this is the “official” one, and that the #49 (Edgar Martinez, but not THAT Edgar Martinez) is some sort of goof-up. In the picture showing the discrepancy, I also don’t see the piping that shoudl go around the neckline on Martinez’s jersey, but that could be the result of the way he’s hunched over and/or the long hair. I noticed someone mentioned the lack of women’s merchandise, so I’ll put a few items up today. Here’s a link from a recent Cincinnati Enquirer article that says the Reds will reveal thier new uniforms at Redsfest in early December. It’s about 3/4 the way down. It doesn’t say they are adding navy blue, but just eliminating black. I wrote a letter to the reds in June asking to use the 1956 uni as a foundation for the new ones. [quote comment=”7283″]If you are going to go with the high socks look, is it easier to do it with a shorter inseam than you regularly would go with? it will look much better if you go with a shorter inseam when you wear your socks (stirrups and sanis!) high, because you won’t be rolling them up to get to your knee. I heard again very recently from Marty Brennamann on a Reds radio broadcast that the Redlegs are, indeed, getting rid of the black next year for blue, but that he’s under the impression that it will be closer to a Royal blue than Navy. Whether the uni design changes or the blue just takes the place of black, I haven’t heard. In last night’s ESPN college football game, Mississippi State was sporting some new sock stripage, a bit of a rarity in college football. Red Sox, Braves, Cubs, Indians, Angels, Twins, Dodgers, Yankees (in the logo), Phillies, Rangers, Cardinals, and Nationals. Do we really need another? I like black better than blue for the Reds. 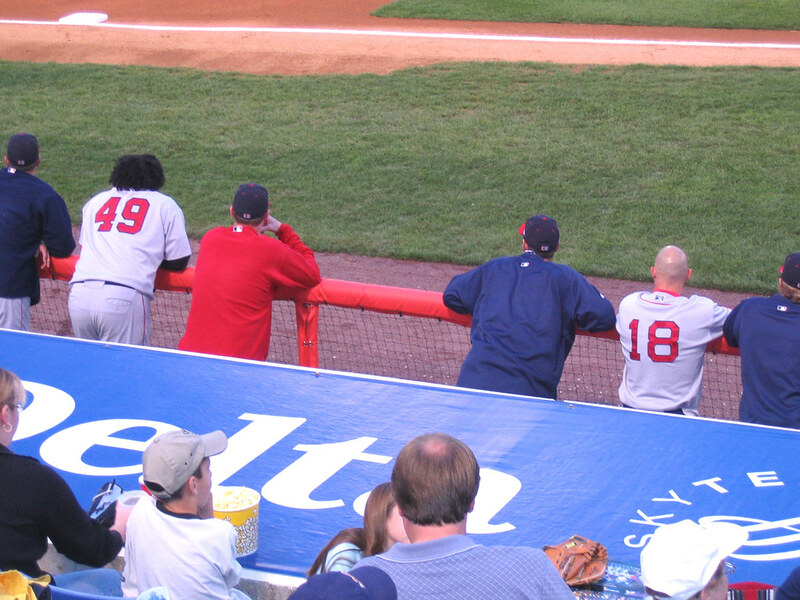 I’ve seen the SeaDogs a number of times on the road and the number font issue has been around for several years. It looks like some of them wear old Red Sox road uniforms. 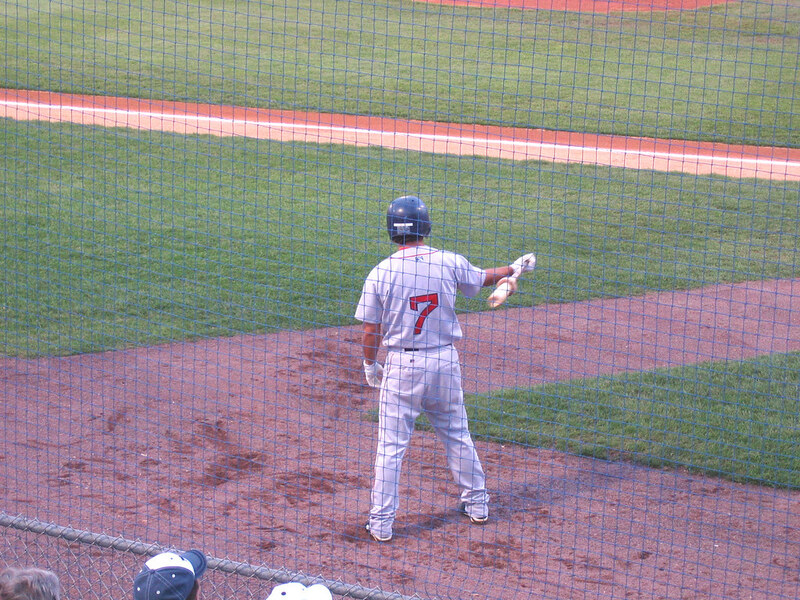 #7 is probably a Trot Nixon uniform with the nameplate removed. It’s not so much that the Reds’ unis use black, (there is historical precedent for doing so), it’s that it’s used as a generic drop shadow in a way that has no historical precedent at all. But whatever. If you’ve noticed, their unis used to use a black tshirt under the sleeveless overshirt (is that the correct term?). That’s pretty much been banished since new ownership took over, you’ll only ever see them wearing red undershirts now. Howard, what they should do is just take the number off and move it up a few inches. Uniforms with the name and/or number placed too low are my biggest pet peeve; they look awful. I blame that MLB collar logo. It’s pushing everything else downward. But you can’t hold UniWatch responsible for the behavior of a few, sick twisted individuals. For if you do, then shouldn’t we blame the whole UniWatch commenting system? And if the whole commenting system is guilty, then isn’t this an indictment of our sporting institutions in general? I put it to you, Andy – isn’t this an indictment of our entire American society? Well, you can do whatever you want to us, but we’re not going to sit here and listen to you badmouth the United States of America. Gentlemen! JUAN SAMUEL IS A MET!? 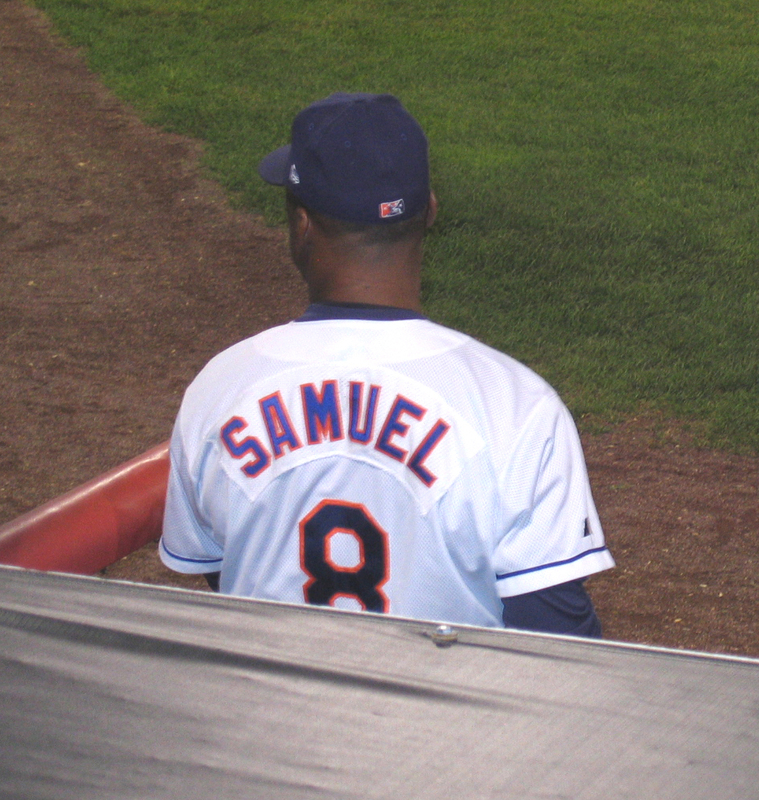 The Dykstra and McDowell for Juan Samuel deal was the worst moment in my Met supporting life. He did nothing for us and was eventually traded to the Dodger for a first baseman and relief pitcher while Lenny went on to have his best years as a Phillie (Philly?). Juan Samuel is a fine example of everything that went wrong in after 1988. [quote comment=”7319″]Howard, what they should do is just take the number off and move it up a few inches. Uniforms with the name and/or number placed too low are my biggest pet peeve; they look awful. I used to do the Orioles uni’s and removing a number isn’t as easy as just peeling it off. It takes a fair amount of time and effort to do it nicely…especially if they are on white unis because the glue from the twill leaves a residue that may or may not come out in the wash.
Plus to be honest…minor league teams don’t really care for the most part. They are all about recycling. Another college footbal tidbit from last night, Central Michigan debuted new uniforms versus Boston College as mentioned in Paul’s ESPN article. The worst part about them is that the rear piping is broken up by the nameplate. It just shows lack of attention to detail by NewBalance. 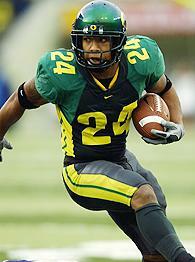 ESPN Page 2 has a vote for the best Oregon uniform contest and THISis winning! THIS CLASSY THROWBACK Mainly because it didn’t give me a headache and reminds me of the NY Giants WHITE/RED simple throwbacks. I truly like the high pants in baseball but hate it when they have the solid color socks instead of the stirrups. I think if you’re going to hike the pants up you should really have the stirrups and do it the right way. When I see the high pants with the solid colored socks it makes me shed a little tear because I want to see a stirrup too. Dallas Morning News has a Texas A&M newsletter with a Q&A section w/ their writer Rachel Cohen. Q: It seems the Aggies have been using the same uniform for years. Uniform changes at other schools tend to amuse fans and spur licensed merchandise sales. Does Ã¢â‚¬Å“traditionÃ¢â‚¬Â explain the reluctance to change at Texas A&M? 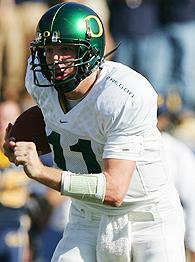 Are there any uniform changes slated for 2006? COHEN: There are some minor changes for this season, mostly involving the type of fabric, which wonÃ¢â‚¬â„¢t be very noticeable. One difference is that the players are wearing maroon shoes. I asked athletic director Bill Byrne if there were any major plans on the horizon, and he said that the coaches and Leadership Council (the advisory group of players elected by teammates) have a big say in whether the uniforms should change, and they havenÃ¢â‚¬â„¢t expressed interest in doing so. He also said he hasnÃ¢â‚¬â„¢t gotten the impression that many fans are interested in significant changes. I think the Ã¢â‚¬Å“traditionÃ¢â‚¬Â thing has a lot to do with that. Byrne did say there has been discussion about using throwback uniforms in some games, but nothing is imminent. Women’s longsleeve shirts and women’s babydoll shirts are up. Postage stamps are up but waiting for approval (should be a day or so). I wouldn’t necessarily consider certain logos in a video game as logo creep (unless of course you count the ridiculously pervasive and gratuitous use of Burger King logos in the EA’s Fight Night). In Madden 2007 (on the Xbox 360 version at least) the players wear Reebok cleats. This is not so much logo creep as it is art imitating life (after all Reebok is the only logo allowed to appear on the field at an NFL game…somebody feel free to correct me if I’m wrong) and so the video game is merely showing logo creep that already exists and is not really therefore logo creep in and of itself. Unrelated Madden note, I wish you could still hit guys after the player like you could in Madden ’94. Stamps? Awesome! Seriously. Way to go Ek! On my highschool hockey team one of our teamates passed this monday and his number has been retired. In order to commemorate him we would like to do something maybe a patch or a helmet sticker. His number is 15 and initials VL any suggestions. Or anyone know of a site were i can purchase something of this sort. [quote comment=”7344″]On my highschool hockey team one of our teamates passed this monday and his number has been retired. In order to commemorate him we would like to do something maybe a patch or a helmet sticker. His number is 15 and initials VL any suggestions. Or anyone know of a site were i can purchase something of this sort. My condolences. Perhaps you could use a font like this Initials With Wings? I know it’d be more traditional to have a wing coming out of the left of the “V” and the right of the “L” but this kind of gives the sensation of movement which, you know, happens in hockey. [quote comment=”7345″][quote comment=”7344″]On my highschool hockey team one of our teamates passed this monday and his number has been retired. In order to commemorate him we would like to do something maybe a patch or a helmet sticker. His number is 15 and initials VL any suggestions. Or anyone know of a site were i can purchase something of this sort. Sorry, click “uppercase” and then type in VL and you’ll see what I mean. that was max dugan, rush chairman, and he’s damn glad to meet you. First, my condolences. When I coached football, this company was good when we needed to order new helmet decals. Here is the link, sorry! The broadcast that I heard, mentioned the Reds uniform secondary color as royal blue. Also the unis would be much plainer than the current ones. No pin stripes? Thanks, Ek, (your old/new nickname, apparently), for the women’s gear. I’m glad they come in black. From the World-Wide Web Leader. Apparently, DJ Gallo reads Uni Watch. Now in Year 2 under head coach Urban Meyer, the Gators are completely formed in his image. Well, almost. They’re completely formed in his image except for one misplaced, disgusting orange sleeve still stuck back in the Ron Zook era. I’m watching the Packers’ pre-season game today (regional coverage only, I think) and as is years past they are going against league rules concerning the nameplates. E.g. both QB Aaron Rodgers and WR Cory Rodgers just have “Rodgers” on the nameplate. I know this isn’t just a pre-season thing because they have bucked the trend in years past. I was kind of hoping to see them change this year. Where is the precedent? I went through every Reds uni from 1900 on the “dressed to the nines” section of the HoF, and not ONCE did I see black as any kind of color until 1999—-unless we’re counting cleats. Not that I don’t believe you, but I’d like some supporting evidence. I’m pretty sure Uni Watch calls this a vest. I think I am in the minority in liking the black balance in the Reds uni’s. The purists be damned on this one–I hated the old simple Red and White, including their refusal to rid themselves of the polyester solid tops in the early 90’s (the last to do so amongst MLB teams I think). As far as a 50’s-60’s-esque addition of blue…I too think that there are too many teams already that have that mix. Love the site, I thought I was the only person out there that put this much stock into logos and uniforms. Would love to use some of your content from time to time if you approved, on my sports blog site. Please check out http://www.kegeratornation.com. It’s official, the names will be on Texas A&M Unis. Just heard the Arizona Diamondbacks will be getting new color schemes next season. These would only look normal if the players were seven feet tall; as they are it looks really unbalanced. Logo creep (or is it sponsor creep?) in European hockey is getting surreal. These are the *national* teams. [quote comment=”7359″]Just heard the Arizona Diamondbacks will be getting new color schemes next season. You know they mention ESPN breaking the news in that article… I wonder what writer had the goods. any info on what the big green V is for on the back of the fresno st. helmets tonight? thanks, sounded familiar but i couldn’t place it and i figured someone out there had a better memory than me. The green V on the back of the Fresno State helmets stands for Valley. An inland California school, the V is an effort to represent Fresno’s agricultural Valley on the unis. IÃ¢â‚¬â„¢m watching the PackersÃ¢â‚¬â„¢ pre-season game today (regional coverage only, I think) and as is years past they are going against league rules concerning the nameplates. E.g. both QB Aaron Rodgers and WR Cory Rodgers just have Ã¢â‚¬Å“RodgersÃ¢â‚¬Â on the nameplate. The league is OK with no initial and duplicate last names – the Steelers have done it that way since they put names on their uniforms in 1970. The green V stands for a bunch of land in Central California. It’s called The Central Valley, The San Joaquin Valley and probably some other things. I know because I live in it. Fresno State is pretty much “The Valley’s Team.” They are the only D-1 team here in the Valley. We all have their backs. Oh ya, and msn.com did a little part on the Top five worst college football uniforms, thought you might want to see it. James Blake did an Agassi clothing tribute Friday, wearing one of his old pink and black shirts. He was also reported wearing pink compression shorts under his black shorts, but I haven’t found a full-length photo. John, a merchandise question. The Zazzle site seems to give you a choice of what you can put the logo on… like a ringer T or a softball shirt or some other colored t-shirt. Are these options not available? Am I limited to just what is seen on the main page (white, grey, etc.)? Anyways, the topic of red, white, and blue MLB unis reminded me of how I always thought it was unusual that the only place that red is used on the Dodgers unis is on the front numerals. (as far as I can detect it isn’t used in any trim or piping) I couldn’t think of another instance where a color was used so specifically. Correct me if I’m wrong, but didn’t the Reds have blue in their color schemes in the past (and I’m not including their efforts during the 1950s to mess around with the team name)?